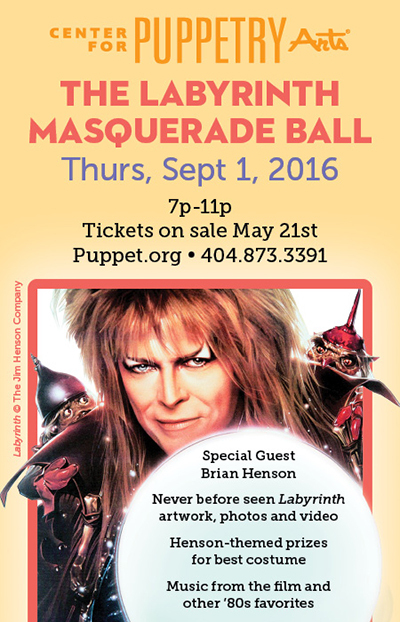 EPBOT: Labyrinth-Themed Ball Coming To Dragon Con This Year! Labyrinth-Themed Ball Coming To Dragon Con This Year! The ball will be held at Atlanta's Center for Puppetry Arts, NOT one of the Dragon Con hotels, but since it's happening the first night of Dragon Con the two have partnered together. A magical, exclusive night to celebrate the opening a new special exhibit - Jim Henson’s Labyrinth: Journey to Goblin City at Atlanta’s Center for Puppetry Arts. Be the first to see this spellbinding collection of goblins and gowns, with behind-the-scenes artwork, photos, and video to guide you on your journey into the world of the Goblin King! Wear your Labyrinth or masquerade costumes and masks to participate in a costume contest judged by Brian Henson, Co-CEO of the Jim Henson company! Pose for photos on the Goblin King’s throne and dance to the music from the film and other dance favorites from the ‘80s. Changing room and bag check provided. Beer and wine cash bar. Complimentary heavy hors d'oeuvres. Free Dragon Con shuttle service to and from the Center for Puppetry Arts. Tickets go on sale May 21st at noon and will be limited. Last night John and I watched the film and all 2 hours of behind-the-scenes featurettes again, so I. am. PUMPED. Who else will we see there? You are amazing, b/c I had no idea this was happening! Hopefully we will be there!! So not fair! All the cool stuff always happens over 2500 miles away. *Humph! Will I be able to go if I wish hard enough?!?? I wish the goblins would come and take me away...right now (to this event!!!!!) oh gosh what I wouldn't give to go to this. I can't wait to see pictures and see your review!!!! I think that the test helmets in your last post are a good base for making goblin helmets. I would so go as one of the goblins that rode the two legged thing, or maybe as someone from As The World Falls Down. Oh oh oh! OR the pixie from the comic Return to the Labyrinth. So many possibilities! OMG, please, please, PLEASE take lots of pictures for those of us who can't go!!! This sounds so AMAZING!! I take it you didn't see this video promoting last year's Masquerade? I love The Center for Puppetry Arts! I used to go there frequently, for performances and classes. It's one of the things I miss about no longer living in Atlanta. I would so go to this if I still lived there! I showed this to my husband, and he mentioned that it would be a great place to get ideas for Ludo costumes. I assured him that Jen from Epbot always takes lots of fantastic pictures. SON OF A BISCUIT! Why didn't they announce this before we picked a wedding date?!?! I need to go to this. Looks like I'll be creating one of the Labyrinth based designs I had been working on as an homage to Bowie and the 30th anniversary. okay, the d*** computer isn't cooperating. Take Agnes. PLEASE take Agnes! Brian will LOVE HER! Pleeeeaaaasssse!!!! !